AASHTO's H-20 and HS-20 are live load ratings applied to the design of bridges or other suspended items (e.g. lids for concrete vaults). Designers use H-20 or HS-20 from AASHTO, or specific axle configurations, to express the extreme load effect created by heavy vehicles such as transports, buses and fire trucks. These in turn are used to calculate the moment (bending) and shear acting on a bridge or other suspended segment as the vehicle passes over it. For example, the lid of a concrete vault would need to be able to support the specified loading to make sure a heavy vehicle will not collapse the lid and fall into the vault itself. Do Pavers Meet H-20/HS-20 Loading Design Standards? A common question posed by design professionals is the ability of pavers to withstand fire truck loading and meet AASHTO’s HS-20 loading specifications. This is an important design consideration due to the extremely high axle weights that fire trucks exert; in fact, certain states (California for example) have created fire truck exemptions whereby the maximum allowable weight of a fire truck can exceed the Department of Transportation allowable weight restrictions. Every paver in the Belgard product line is manufactured to exceed these design standards. AASHTO's H-20 and HS-20 are live load ratings applied to the design of bridges or other suspended items (e.g. lids for concrete vaults). Because the pavers sit on a flat aggregate surface, they are not subject to the same bending moments and shear, and therefore will not collapse under the applied loads. Paver systems are actually designed for thousands, if not millions, of ESALs, which represent the estimated number of vehicles that pass over the surface during the design life. 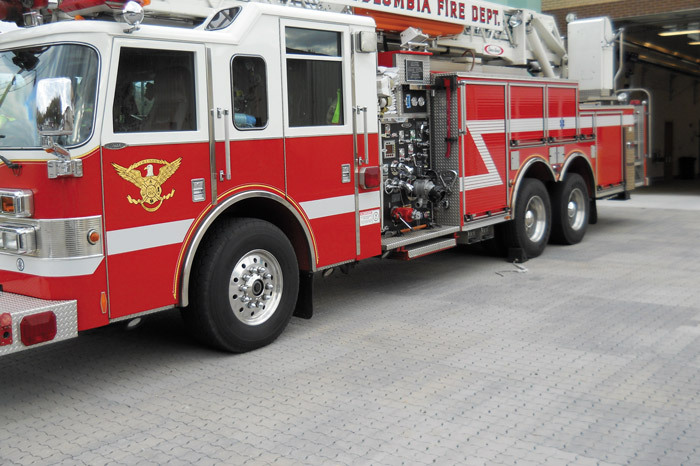 In terms of being able to withstand the surface pressure exerted by the truck tires, the heaviest gross axle weight (GAW) for a firetruck that is allowed is 24,000 pounds. Assuming standard tires are used (even though Super Single tires are required) the maximum weight on each of the wheels is 12,000 pounds (24,000 pounds/2 wheels). Using a conservative contact area on the bottom of the wheel of 8 inches square, the pressure exerted by each front wheel is 187.5 psi (12,000 pounds/64 square inches). Any concrete paver offered under the Belgard line is made in accordance with ASTM C936, which calls for an average compressive strength of 8.000 psi with no individual unit being less than 7,200 psi. So, simply put, the pavers are on average 40 times stronger than required to withstand the surface pressure that would be exerted under the most extreme conditions. For more design specifications on fire truck loading download our Structural Design of Roads for Fire Trucks PDF.